LOS ANGELES (August 8, 2016) - Enter the world of Westeros with the Game of Thrones® Live Concert Experience -- an immersive music and visual experience that will bring the Seven Kingdoms to life on a scale never seen before. Using state-of-the-art technology, Game of Thrones® composer Ramin Djawadi, along with a full orchestra and choir, will take fans on a musical journey through the realm - from King's Landing to Winterfell, along the northern stretches of the Kingsroad to The Wall and across the Narrow Sea to Braavos, Meereen and beyond. Fans of the groundbreaking, critically-acclaimed and Emmy® Award-winning show will finally have an opportunity to immerse themselves in the Game of Thrones® universe through the breathtaking score created by Ramin Djawadi. As rich as the stories, intrigue and world of Game of Thrones®, Ramin's celebrated music for the show resonated immediately with fans as the meticulously constructed songs underscored the emotional weight of key moments between beloved characters, lent scale to massive battle sequences or brought to life songs referenced in the books. Ramin's relentlessly popular title track alone has become instantly recognizable as a pop culture phenomenon in its own right. Fan enthusiasm for the music from Game of Thrones® continues to grow with each season. The tour, produced and promoted exclusively by Live Nation inpartnership with HBO Global Licensing, will use innovative music tour production and video technology that will recreate the various realms found throughout Westeros and Essos as well as showcase footage from the show in addition to all new imagery created exclusively for the tour. Beginning its journey on Wednesday, February 15, 2017 in Kansas City, Mo., the highly-anticipated tour will visit 28 cities across North America with shows scheduled at famed live music venues including Madison Square Garden in New York City and the Forum in Los Angeles as well as arenas in Montreal, Boston, Houston, Las Vegas, Philadelphia, Washington DC and more. Tickets go on sale starting Saturday, August 13 at www.livenation.com. American Express® Card Members can purchase tickets before the general public beginning Wednesday, August 10 at 10:00 a.m. through Friday, August 12 at 10:00 p.m.
Ramin Djawadi's previous credits include the Grammy® nominated score for Marvel's 2008 blockbuster,Iron Man. Other film credits include Pacific Rim, Clash Of The Titans and Warcraft. In addition to Game Of Thrones®, Ramin also garnered Emmy® Award nominations for other television projects including Flash Forward (ABC) and Prison Break (FOX). Among Ramin's upcoming projects is the highly anticipated HBO® series, Westworld. "For the past six seasons of Game of Thrones, I have been tremendously inspired to compose music to David Benioff's and D.B. Weiss' extraordinary adaption of George R.R. Martin's epic 'A Song of Fire and Ice' series," says Ramin Djawadi. "Now, by combining the music with state of the art technology, we are going to bring the astonishing world of Westeros to fans in a live and unique concert experience." "For seven years, Ramin has been blowing our mind with his music's force, subtlety, and endless inventiveness," said Game of Thrones® creators/executive producers David Benioff and D.B. Weiss. "The GoT Concert Experience will be unique in the history of concert tours, an eye-popping, ear-splitting, phantasmagoric blend of the show's visuals and Ramin's powerful compositions. We are more excited for it than anyone." "Game of Thrones has one of the most engaged audiences in television," said Josh Goodstadt, Vice President, HBO Global Licensing. "We can't wait to see fans and newcomers alike immerse themselves in Ramin's incredible music and the world of Westeros through this epic concert experience." 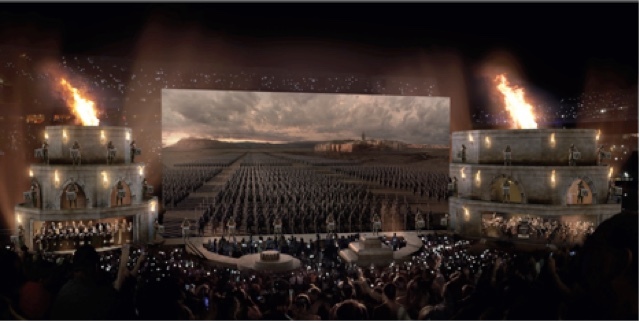 "Live Nation is honored to be partners with HBO and Ramin Djawadi in bringing fans of the hit series a spectacular live experience centered around the music of Game of Thrones and performed using cutting edge technology to create a show unlike anything seen before," says Omar Al-Joulani, SVP, North American Touring at Live Nation.